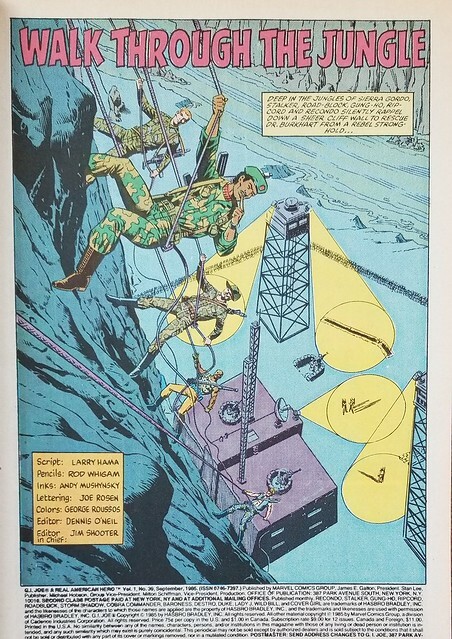 The issue begins with a small team of Joes rappelling down a sheer cliff. They are on a mission to rescue Dr. Adele Burkhart who was captured again while on a humanitarian mission in Sierra Gordo. 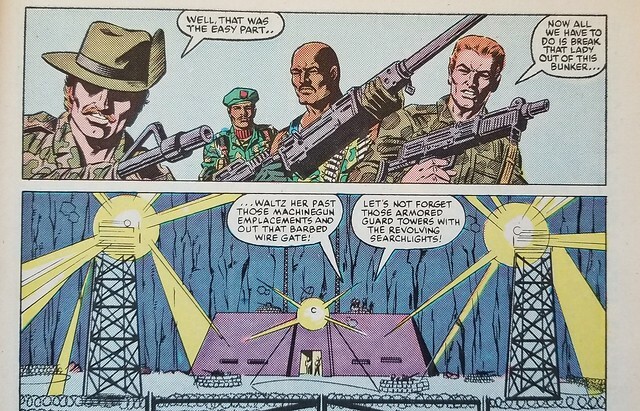 The Joes refer to rappelling down the sheer cliff face in the dark as "the easy part." Now they need to defeat a hardened fortress in the jungle guarded by watch towers, machine gun emplacements, and numerous guards and snipers. If it was easy, they would have sent someone else. 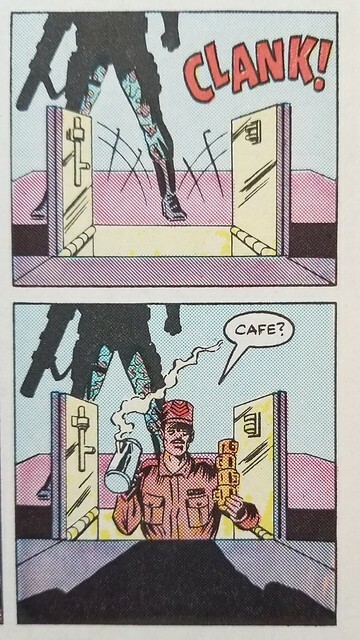 As they whisper, trying to decide how to gain access, a guard appears with some coffee for another guard.Hey, at least these terrorists are polite and well-mannered. Actually...bad guys don't get points for that. Gung Ho promptly kicks the terrorist barista with no regard to the noise discipline Stalker had been referencing previously. The Joes catch the cups and the carafe and keep the noise down. 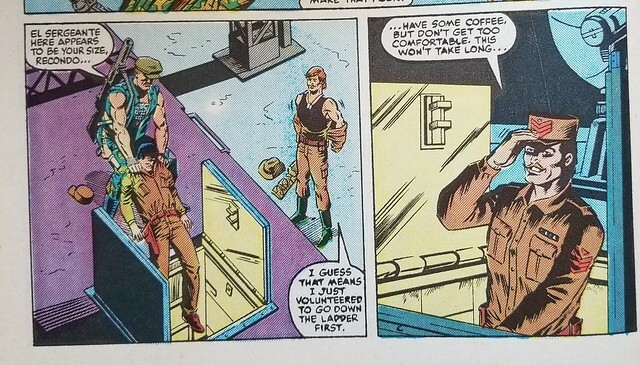 Recondo make a quick costume change to descend the ladder as if HE was the coffee guy. Down below, the local thugs are trying to get information out of Dr. Adele Burkhart. Since they are in cahoots with various spy agencies and governments, they believe she is actually a CIA agent or some type of spy. 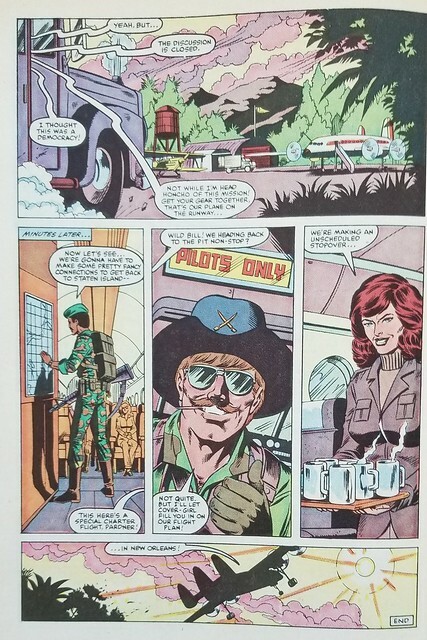 Actually, if she was, that would explain a lot more about how the Joes kept getting sent to rescue her. The thug scientist has a stereotypical evil bad guy vibe to him. 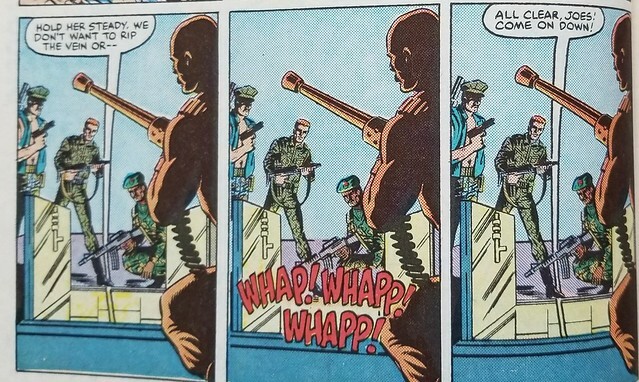 Just in the nick of time, Recondo takes out the bad guys without firing a shot. 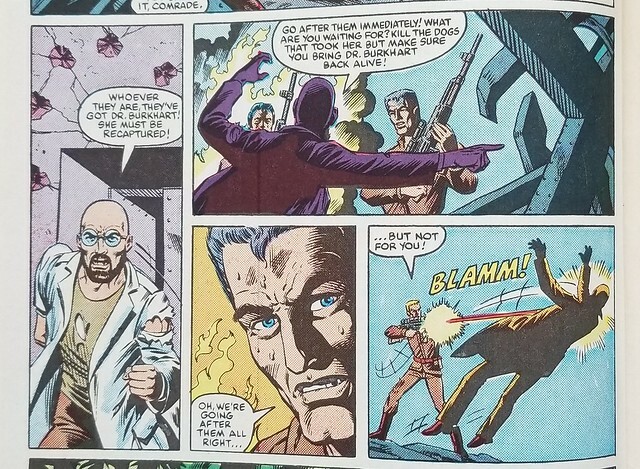 After Recondo calls up to the Joes that it is all clear, Stalker descends and questions Recondo on whether he used his knife on the interrogator and the two guards. But he only used it to cut Dr. Burkhart free. 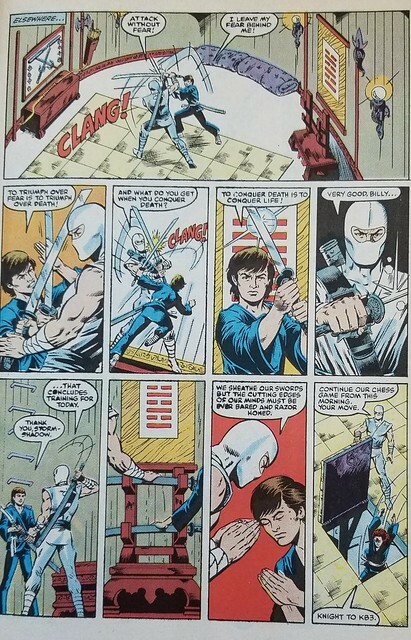 Elsewhere, Billy and Storm Shadow are training in Storm Shadow's secret hideout. They spar and then they continue a chess game they are playing in their minds. Trying to keep track of all the pieces when the board is in front of you is one thing. They are playing the whole game and keeping track of the pieces in their memory. 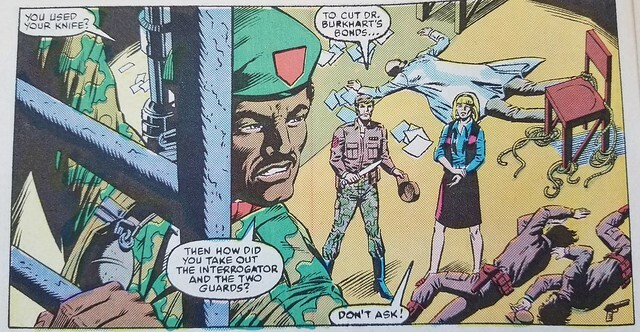 Back in Sierra Gordo, Dr. Burkhart puts on a uniform and the Joes plan to waltz out to the front gate fight their way out there and make a break for it. But the snipers in one of the watch towers are suspicious about the numbers of guards going to replace the front guards. They start shooting at the Joes and Dr. Burkhart, but thankfully the Tucaros (local tribesmen helping Recondo) provide some cover fire from the cliff top. Unfortunately for the Tucaros, Dmitri and Gregor are superb snipers. The story never tells us if they are German, Russian, or another faction. But they definitely aren't local to Sierra Gordo. I would guess they originated somewhere around Borovia. They have a fictional Eastern European communist regime vibe to them. The Tucaros are killed outright by the snipers. 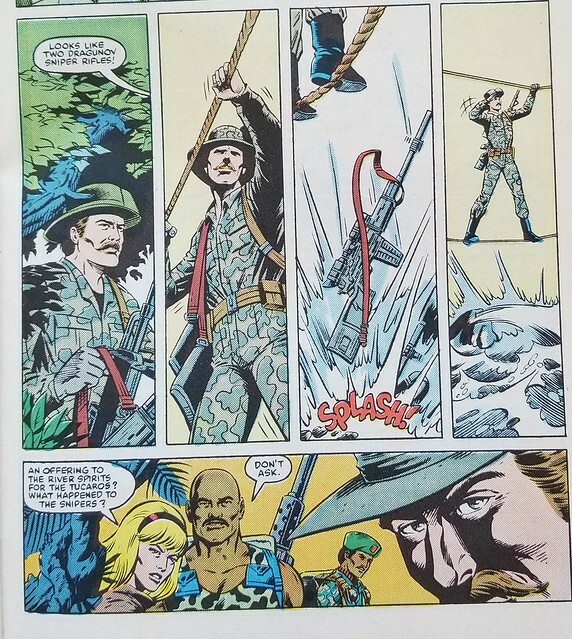 Recondo is distraught for a moment. 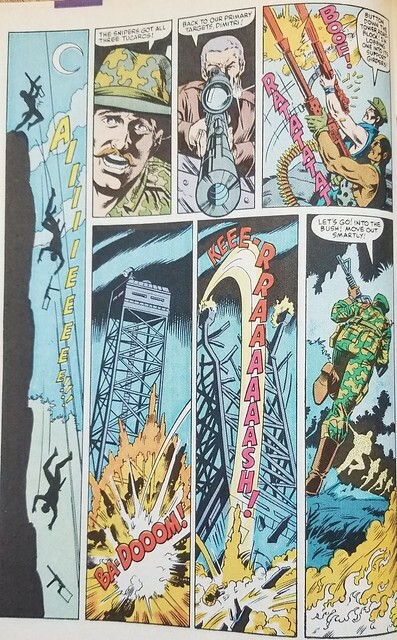 Gung Ho uses his grenade launcher to take out one of the watch towers. Back at Cobra HQ, the Commander is getting a status report from Destro and the Baroness. He is informed Storm Shadow and Billy are still missing and there are no leads. 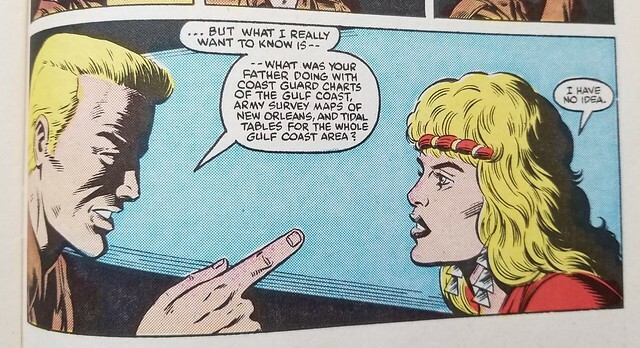 But Tomax and Xamot and a special Crimson Guard escaped from Staten Island, so the Gulf of Mexico operation is still available. The Commander responds that he will oversee that personally. In Sierra Gordo, there is burning ruins of the fortress, tower, and machine gun nests. The interrogator comes out and yells at Dmitri and Gregor to follow after the Joes. Stalker: "Remember kids: Don't run around yelling at Borovian snipers or ordering men with high powered Dragunov sniper rifles to do your bidding." Ripcord: "You could suffer negative social media comments..."
Gung Ho: "...Or get shot in the chest at point blank range, turning your internal organs to tapioca pudding." Clearly the snipers have other loyalties. 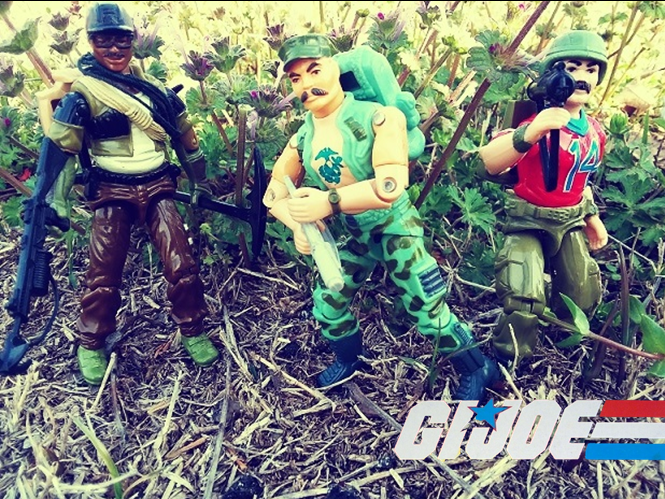 They set out into the jungle at night to pursue the Joes and Dr. Burkhart. 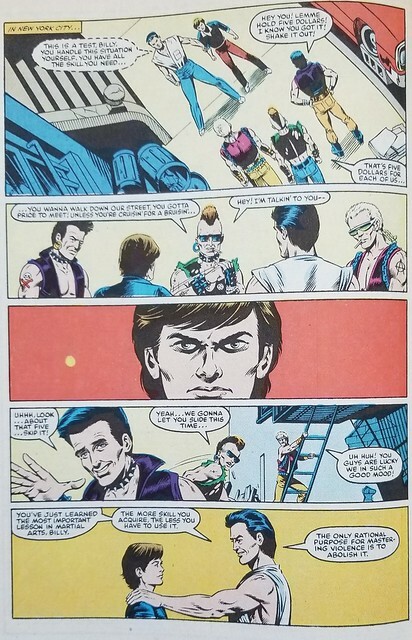 Back in the city, near Storm Shadow's secret hideout, Billy and Storm Shadow are wearing casual clothes and are approached by street punks. This happens to Storm Shadow a lot, and very seldom seems healthy. Storm Shadow lets Billy know it is a test, and he stares them down with intensity. The punks flee and tell them they are lucky. Storm Shadow echoes philosophical words that "the only reason to master violence is to abolish it." That is pretty good for a PSA too, although I think I like mine better. Back in Sierra Gordo, the Joes create a rope bridge to get across the river. 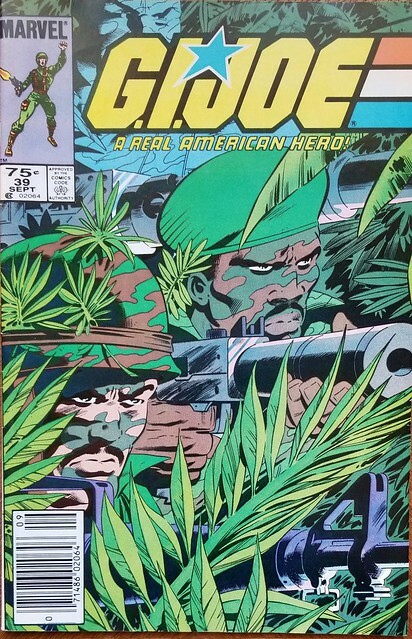 While they work on construction, Recondo returns to the jungle to check out some noise he heard. 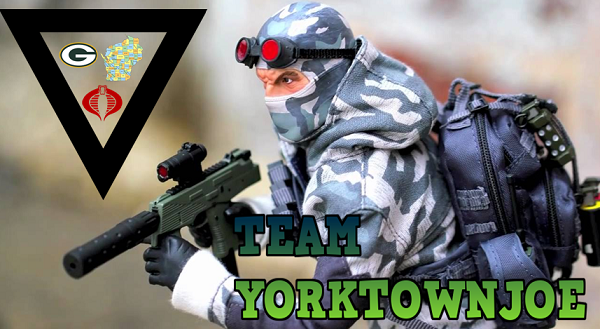 He returns and drops two sniper rifles in the river as a tribute to his fallen Tucaro friends. 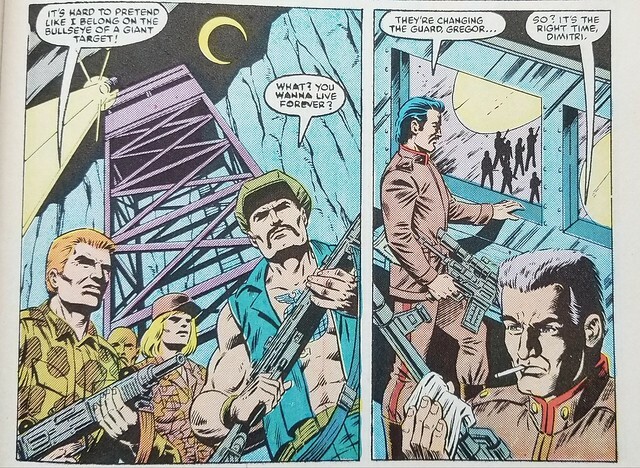 Don't mess with Recondo or his friends. Back at Joe HQ, Bongo the Balloon Bear, also known as Candy is questioned by Duke. (Comic Duke is a lot edgier than cartoon Duke.) They want to know how she didn't know her father was a Crimson Guard sleeper agent. They had recovered surveillance equipment, Cobra propaganda and manuals, as well as maps and other intelligence. She says she doesn't know anything about it. 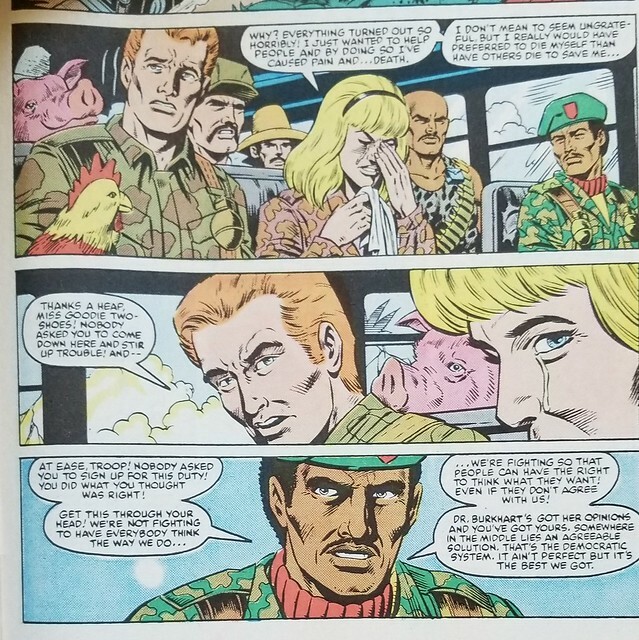 As the Joe team ex-filtrates from Sierra Gordo, we get more philosophical insight from author Larry Hama. Dr. Burkhart shares regrets that she is still alive while others have died or suffered to rescue her. Ripcord has had enough of her sniveling and tells her she should mind her own business instead of venturing into war torn areas trying to spread her world view to people living in peril. Stalker expresses that everyone has a right to their opinion and a solution might lie in the middle. He also shares it isn't a perfect solution, but it's the best we have. Instead of heading back to Joe HQ, they are met by Wild Bill and Cover Girl and informed they are headed to meet others in New Orleans. This issue was action packed and fun. Dr. Burkhart was rescued once again, and we received a few more glimpses that Cobra has something cooking in New Orleans or somewhere in the Gulf of Mexico. Also, scroll back up and check out that sweet cover once again. It was at least a year before I spotted a third Joe on the cover. Hint: Look above the G.I.Joe splash logo. There he is! Roadblock is hiding just behind Stalker. As you look back down you can see a bit of his M-2 Browning machine gun as well. Tune in soon for Issue 40. Now You Know - a little more about: ”WALK THROUGH THE JUNGLE” Feel free to let me know what you thought of this issue in the comments. My favorite part of this issue is that we start to see that Storm Shadow is not really the evil villain we were led to believe he was.